Sometimes when you plan to sit down and write something, you run out of ideas and words. Creating a compelling post and developing a story that hold people’s interest is a process which cannot be achieved ‘on-demand’. There are times when the entire post come to your mind right away and there are times when you are struggling. 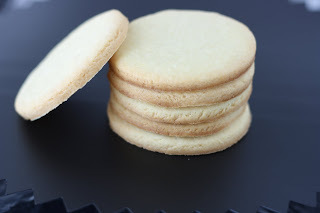 This is one such time so I will jump quickly to the recipe of very easy buttery sugar cookies. This is one of my all time favorite recipes. You can put it in cookie cutter or roll it and make different shapes. This also forms a very good base for all cookie decorations using royal icing. You can use them to make sandwich biscuits using nutella, jam or peanut butter as spread. For more twists you can brush with egg yolks and sprinkle chopped nuts or desscicated coconut on it. Possibilities are endless. Beat butter and sugar until well combined. Add in vanilla and beat until creamy. Add in egg and beat well. Add in sifted flour and mix with hands. Rest for 10 mins in refrigerator wrapped in plastic. Give desired shape and place on an un-greased tray by rolling out and cutting into shapes. Bake in preheated oven at 350 F for 15-20 minutes until golden brown. - You should reserve 1/4 cup of flour and add slowly until fully incorporated, if added at once the dough might run dry and then adding water or egg to combine will not yield same result. The reason being butter's quality and temperature and size of the eggs. - You should not knead the dough, just mix lightly with hands to combine everything, kneading will develop the gluten making the cookies chewy rather than crispy. - chilling cookie dough really helps, after making the dough and after shaping to avoid expanding and loosing shape while baking. 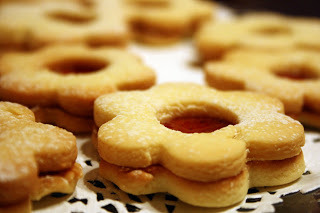 Neat and beautiful clicks and very easy and mouthwatering cookies. I love simple recipes like this. The taste of butter is so prominent. I can imagine these would be wonderful decorated with royal icing. 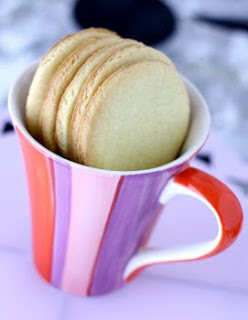 Your first photo of the cookies in a mug is fantastic!